Went into Sainsbury's to pick up a bottle of Smirnoff for £13, and saw these on the shelf. Too good to say no. Not sure if store specific (was in Leicester Fosse Park and stated Sale - while stocks last). I like this brew.Usually around £8 for 10.
they're cans, and no don't think so. This is a really good price! #### they only sell them in packs of four in my local. I'mcheckin round our way! cool! And you should stop drinking Dutch lager and think it's Scottish. British real ale is far better than European. European lager is FAR better than British cr*p.
Think I'll not be buying though - can't stand the taste and seem to get a hangover while drinking it. Which just isn't fair. Hot price.Think I'll not be buying though - can't stand the taste and … Hot price.Think I'll not be buying though - can't stand the taste and seem to get a hangover while drinking it. Which just isn't fair. What?? A hangover after drinking alcohal, who'd of funk it :)? No, WHILE (Hence the bold) drinking it. Couple of bottles (Literally) and I get a headache with it. Absolutely hate Becks but looovvvvvveeeee Becks Vier! So has anyone confirmed this as anything more than a one-off, store specific deal? Got it in stoke on Trent sainsburys got 6 and they gave me 26p back through brand match. worst beer i've tasted yet. Everyone that criticises should have to state what beer they'd prefer so we can find out if it's some p*** like Carling! Everyone that criticises should have to state what beer they'd prefer so … Everyone that criticises should have to state what beer they'd prefer so we can find out if it's some p*** like Carling! Its the strange aftertaste it leaves that I find disgusting. I'm no beer drinking expert, but it's the first i've tried that I was just like yuck after each sip. I think because it's pretty characterless. Normally the cheap stubbies you get are as good or better (Aldi ones definitely and always £1.22 a litre). got last 8 cases in Portsmouth city centre for this price! Thankyou SOOOOOOOOOOOOOO MUCH! 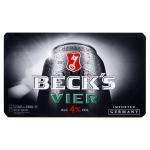 What's the difference to regular Beck's? Do you guys also have Beck's Gold over there? Agree. Non left at Fosse Park today.